In December of 1991, Dr. William Luttge, then chairman of the UF Department of Neuroscience, came across an excerpt from an obscure newsletter, Commerce Business Daily, announcing a call for proposals for a competitive Department of Defense (DoD) grant to build a major national brain and spinal cord research center. The military’s interest in such a center is to spur research discoveries about treating head and spine trauma and other neurological injuries suffered by soldiers on the battlefield. Around the same time, the University of Florida, through its Health Science Center, College of Medicine and teaching hospital, Shands at UF, made a strategic decision to create a unique campus-wide program to harness and enhance the multidisciplinary research, clinical care and educational skills of the entire university and thus maximize our ability to confront the awesome challenges brought on by nervous system disorders. This program was named the University of Florida Brain Institute (UFBI). Newly appointed as the UFBI’s director, Luttge embarked on a logistical tour de force to meet the parameters of the grant application. The requirements, such as a $36 million matching grant from UF, were soon met. And on June 11, 1992, UF had won the $18 million grant, beating out many prestigious universities and neuroscience research centers. Construction of the new building couldn’t be completed, however, until the DoD and Veterans Affairs awarded another $20 million for the project in 1996 and 1997. 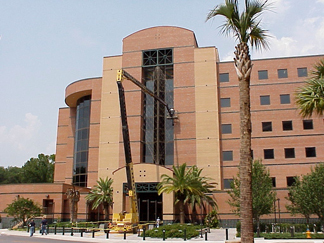 Then on Oct. 22 1998, UF officially opened the doors to its world-class, $60 million UFBI building. With the advent of the new millennium, the UF Brain Institute was renamed the Evelyn F. & William L. McKnight Brain Institute of the University of Florida to celebrate and commemorate a $15 million gift from the McKnight Brain Research Foundation. This award was the largest cash gift in UF history and it was matched by the state of Florida to help create more than a $30 million permanent endowment devoted to fundamental research on the mechanisms underlying the formation, storage and retrieval of memories, the impairments in these processes associated with aging and the development of therapeutic strategies for the prevention and/or alleviation of these impairments in humans.